Wishing you could update your kitchen but don't have the budget for it? Indianapolis flooring store, Kermans has an idea that will give your kitchen a face lift without breaking the bank: install a tile backsplash. More than just cosmetic, a tile backsplash will also add value to your kitchen and help keep things clean in mess-prone areas. The area behind your stove or sink gets messy. Spills and splashes happen and if those areas are drywall... they are a pain to clean up. Add a ceramic or glass tile backsplash and maintenance becomes as simple as using a warm, damp washcloth. Wipe down the backsplash and you've got a sparkling clean wall. A kitchen backsplash is a small change with a big impact. It will update the entire look of the room and updated rooms add more value. You can make the kitchen look more modern or more elegant... cleaner and brighter... all with the addition of a few square feet of tile. Backsplash tiles can be glass, ceramic or even metal. They all carry the benefits noted above while bringing a very different look to your kitchen. People are often surprised at the big visual change from the relatively small addition of a kitchen backsplash. Mosaic glass tiles: Glass tile naturally glows and softly reflects light adding a beautiful touch to any room. Most people select mosaic tiles of different sizes or shades of color to add a colorful, modern feel to their backsplash. 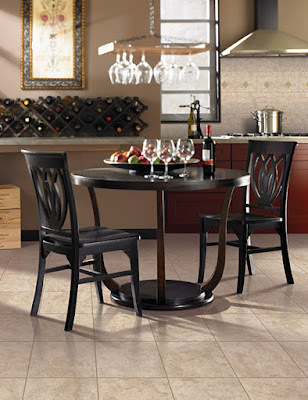 Ceramic tiles: Available in a wide range of sizes, shades and textures, ceramic is a very popular backsplash choice. Whether you opt for the bright, clean look of white subway tile or a mosaic of ceramic tiles that play off your kitchen colors - you can't go wrong with ceramic tiles. Some homeowners will also insert a mosaic design in the center of the backsplash for added effect. Metal tiles: For a very modern look, go with metal tile for your backsplash. Stainless steel, brushed copper or hammered metal all add a very distinct look to any backsplash. Schedule an appointment with one of our tile experts and we'll have samples ready to help you design the perfect backsplash for your kitchen.